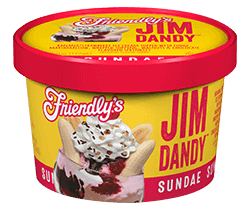 Enjoy a Friendly's famous Jim Dandy™ Sundae anyhwere you go! Our Jim Dandy™ Sundae Cup is made with super rich and creamy banana and strawberry ice cream covered with fudge, marshmallow, whipped topping, walnuts & chocolate flavored sprinkles. Milk, Skim Milk, Sugar, Cream, Corn Syrup, High Fructose Corn Syrup, Walnuts, Bananas, Strawberry Puree, Whey Protein Concentrate, Whey, Buttermilk, Vegetable Oil Shortening With Soy Lecithin (Partially Hydrogenated Palm Kernel, Soybean And Cottonseed Oils), Cocoa (Processed With Alkali), Cornstarch-Modified, Cornstarch, Palm Kernel And/Or Palm Oil, Dextrose, Natural Flavor, Xanthan Gum, Rice Flour, Sodium Caseinate, Beet Juice (For Color), Guar Gum, Citric Acid, Food Starch-Modified, Mono And Diglycerides, Titanium Dioxide, Salt, Modified Cellulose, Polysorbate 60, Sodium Citrate, Soy Protein Concentrate, Artificial Flavor, Polyglycerol Esters Of Fatty Acids, Pectin, Phosphoric Acid, Carrageenan, Artificial Colors (Red 40 Lake, Yellow 6 Lake, Yellow 5 Lake, Blue 1 Lake, Blue 2 Lake, Red 40, Yellow 6, Yellow 5, Blue 1, Red 3, Blue 2, Green 3)*, Dextrin, Flaked Corn, Carnauba Wax, Confectioner'S Glaze, Gum Arabic, Gum Tragacanth, Cellulose Gum.